Morning steam rises from Crested Pool in the Upper Geyser Basin. My eyes scan the geyser basin, pondering the vapors being belched from somewhere deep below. In winter the steam is abundant, clinging to trees and boardwalks, coating animals and plants in ice, making trails slippery. The mists move down-valley on the back of invisible currents, obscuring and revealing. A billowing plume rises over every thermal feature. 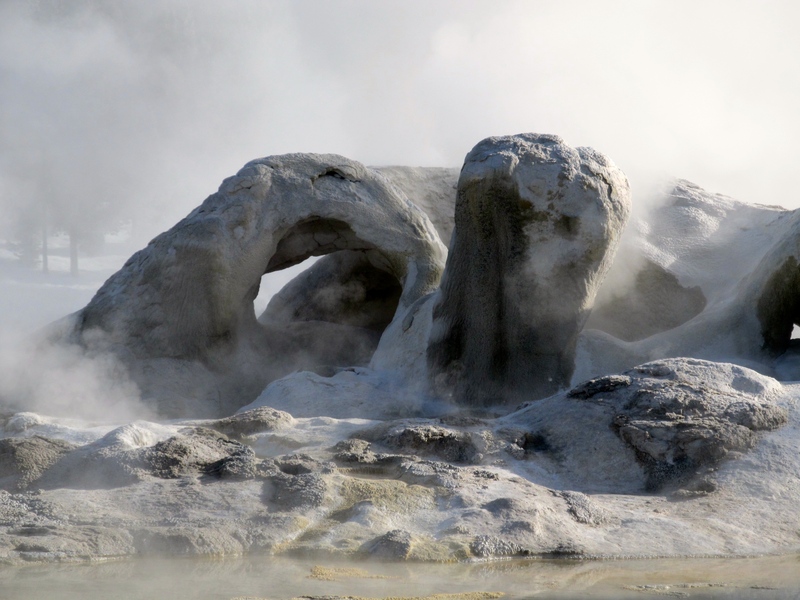 Grotto Geyser, belching… dragon’s breath? My ears sharpen, picking up odd sounds that seem out of context. The small geyser bubbling between eruptions sounds just like a pot of eggs boiling rapidly on the stove. I hear Beehive, a dramatic cone geyser, before I see her, roaring like a firehose at full blast, sending spray 175 feet in the air for minutes at a time. I ski pass Grotto Geyser, with multiple cave-like openings, Middle-Earth-like; some frightful leviathan occupies its depths, whump-whumping as it thrashes. Ga-WHOOMP goes its tail, which is probably not a tail but a reservoir of super-heated water remaining under great pressure. At least that’s what my brain tells me; my neck hairs know differently. My nose, accustomed to the pure clear air here, catches whiffs of “rotten egg” smell at some pools. Underground deposits of sulfur are plentiful, acidifying some thermal features, helping create mudpots. Ski to the famous Morning Glory Pool if you like. My face tingles in the crisp air as I ski, and when a steam cloud envelops me on the boardwalk I can feel the temperature jump for a few seconds. It is no wonder the bison hang around these warm spots in winter. Taste? A tiny feast — fresh snowflakes on my tongue! If you could add a sixth sense to enhance your enjoyment of the natural world, what would it be? It’s the dead of winter. My newly-waxed skis slip rhythmically across the shining snow; out-of-practice muscles welcome the exertion. A coyote ambles past, making its circuit, following its nose, and a lone bison munches on green grasses it exposed using its massive head as a snowplow. Two trumpeter swans ply the Firehole River. Plumes of steam, rising like “the watch-fires of a hundred circling camps,” confirm that I am in the Upper Geyser Basin of Yellowstone National Park. Yellowstone is a geothermal hotspot atop an active super-volcano, its immense magma chamber roiling just a few miles below the surface. 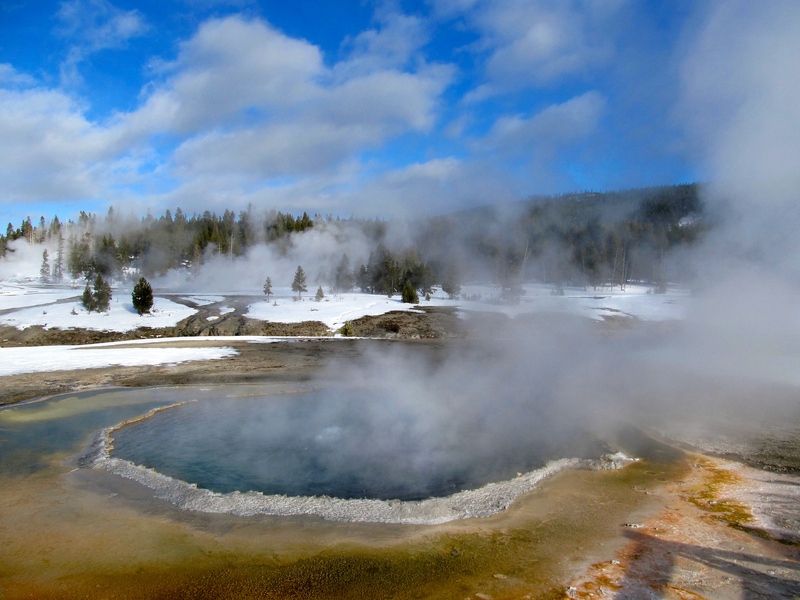 Here, geysers expel super-heated water; hot springs burble and boil, fumaroles hiss, mudpots blurp. The ground feels quite alive under me, sounds and smells and sights emanating from a mysterious subterranean labyrinth. 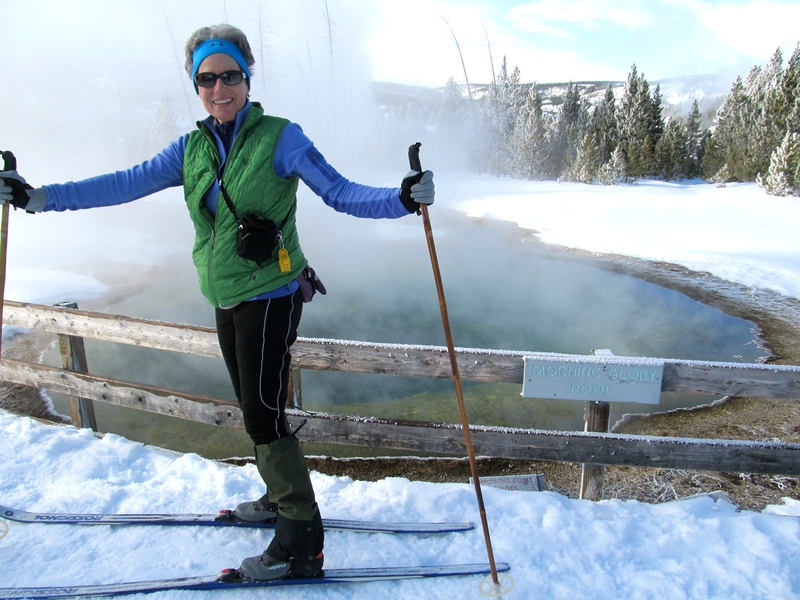 Dazzled I am; few places can astound the senses like wintry Yellowstone can. I have the extreme privilege of being at Old Faithful, deep in the interior, visiting my beloved who is a winter seasonal park ranger. Fewer than 100,000 visitors — not even 3% of annual visitation — brave the obstacles to experience Yellowstone in winter. This is the solitude season, surely the most stunning of them all. Leave a comment: What stops you from considering a winter visit? What does winter’s last day look like? During a break in the storm, mid-morning clouds dapple the desert near Buck Canyon. Monday was the last day of winter, and a lingering Pacific storm brought meteorological extravagance to our park. 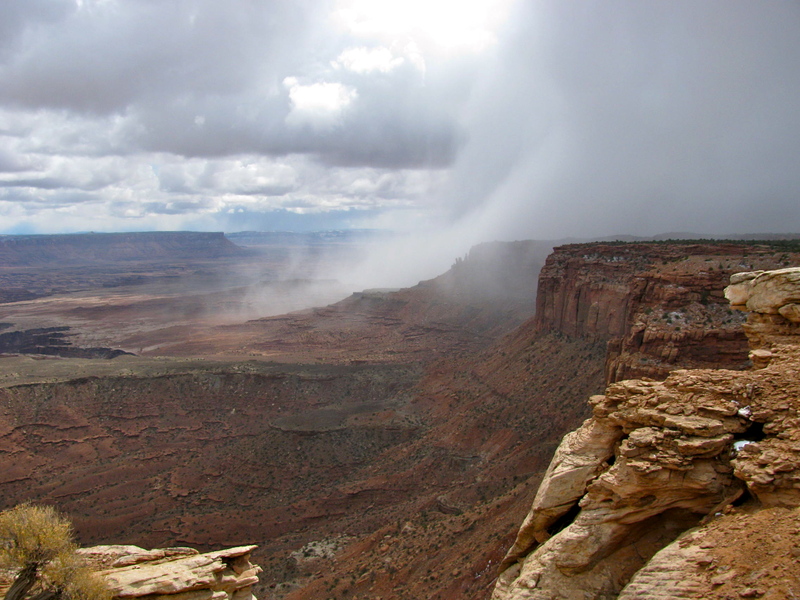 I happened to be out in it, happened to have my camera, and happen to believe that Canyonlands’ beauty peaks during wild weather. See what you think. Mists sweep into -- and out of -- the canyon depths. This phenomenon happens only infrequently and it is remarkable to watch. 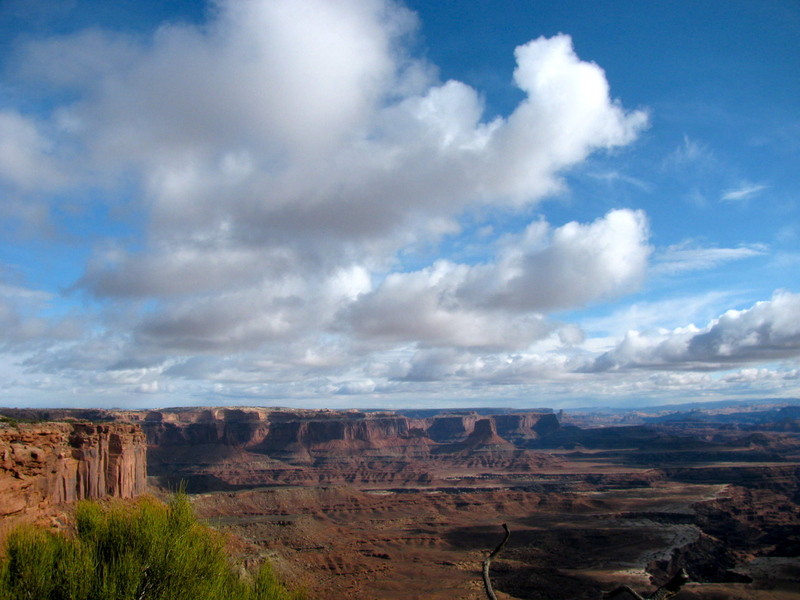 Clouds & blackbrush. North of La Sal Mountain Viewpoint, Arches National Park, Utah. Our training day for natural history took us out in the storm-ish morning. A front was passing through Arches National Park; the chill air didn’t bother us unless we stopped too long to listen to a talk about grasses, or amphibians, or water quality. I was taking photos as the light changed by the minute, trying to capture the day’s feel. No special lens, no special camera, just a very special mood courtesy of filtered clouds and mists. I hope you enjoy these shots from one of Arches’ loveliest locales, Courthouse Towers. Three Gossips & Sheep Rock. 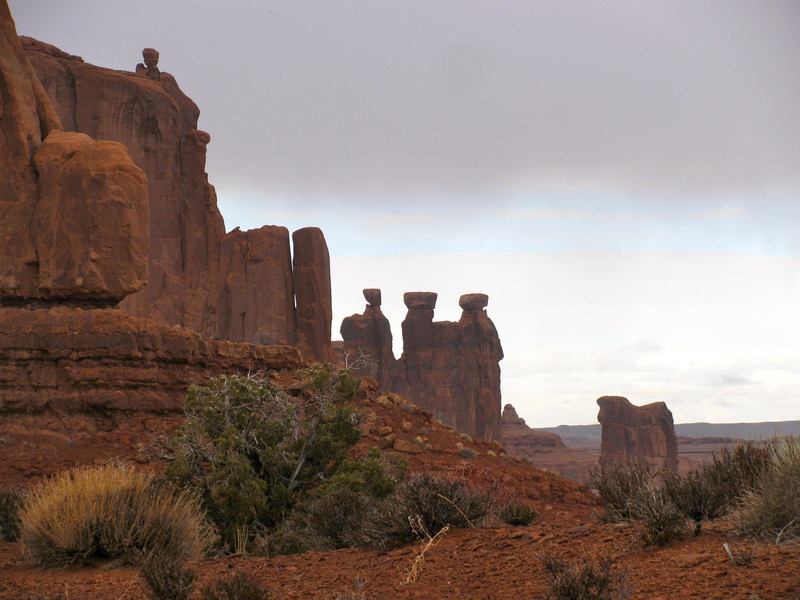 Courthouse Towers, Arches NP. 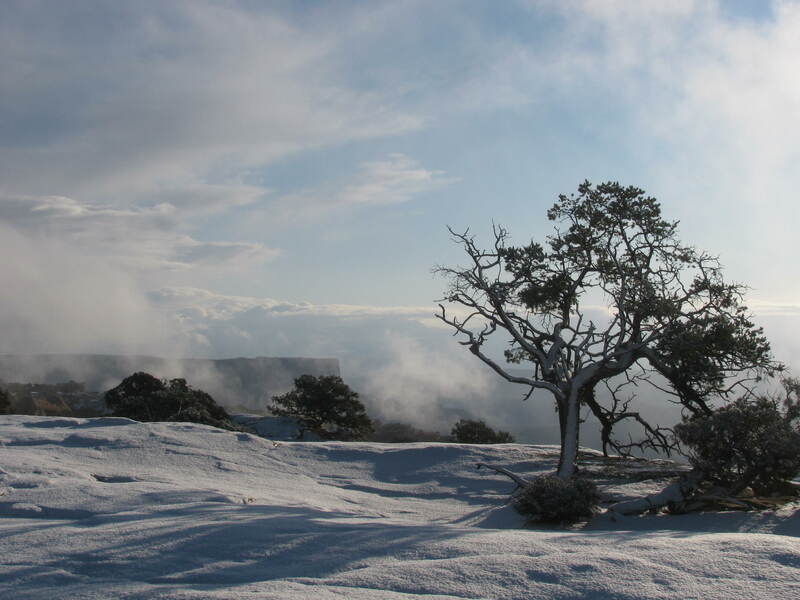 Morning inversion -- clouds surging up from Shafer Canyon, 8:15 a.m.
On the park radio channel each morning at 0930, after the daily weather report, the various districts in the area broadcast their weather information from the past 24 hours. This allows us to better direct visitors in their travels, as well as inform any staff working in the backcountry. You can imagine that normally it is a very businesslike script passing over the airwaves. I felt like such a rebel. As far as I know, I didn’t get in trouble. One other time I took a chance and reported in all seriousness that the forecast was brought to you by the adverbs ‘mostly’ and ‘partly,’ after which I read the three days of mostly sunny and partly cloudy NOAA forecast word for word as I usually do. I felt that that was grammatically interpretive and not too far out of line. My co-worker admitted he didn’t know those words were adverbs. I felt doubly useful. Radio dispatchers abhor flippant or too-casual usage, so I am very careful. But just look at the accompanying photo and tell me that you wouldn’t have done the same. 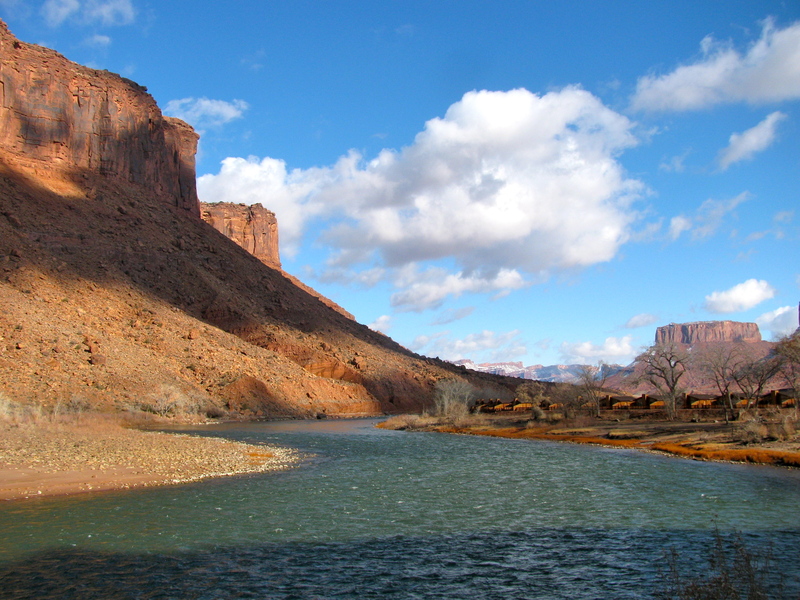 The Colorado River north of Moab, Utah, in December's pale light. Note teal instead of brown water. A powdered-sugar dusting coats the rocks; thick vanilla icing smothers the mountains. Utah welcomes me with fresh snow, heightening the contrasts: reddest sandstone, bluest sky, sere brown remnants of this season’s grasses. I smile. 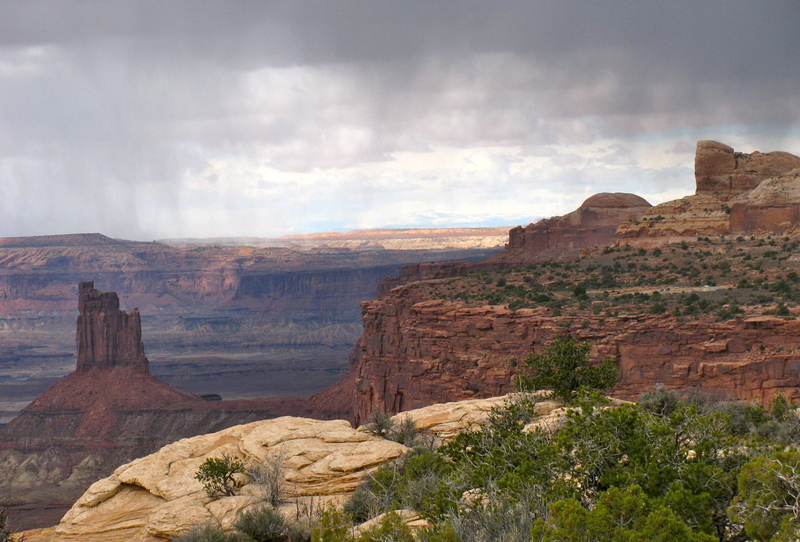 Returning to the Colorado Plateau — where I feel deeply attached, fully belonging — is joy, great joy. My Minnesota address seems like another universe rather than two days’ drive. Winter’s light is thin, transparent. Is it anemic and wan, or is it merely saving itself for an April assault on the senses? Landscapes change as the weak rays attenuate visual distractions, focus my eye on texture and composition. I seem to see better when the days are short and angles are low. As I round a bend on Highway 128, the Colorado River startles me with atypical clarity and color. It’s normally carrying tons of sand and silt, brown and muddy; I’ve never seen the bottom. In December it almost resembles a mountain stream. I blink twice and take off my sunglasses to double-check the hue, so surprising is the difference. 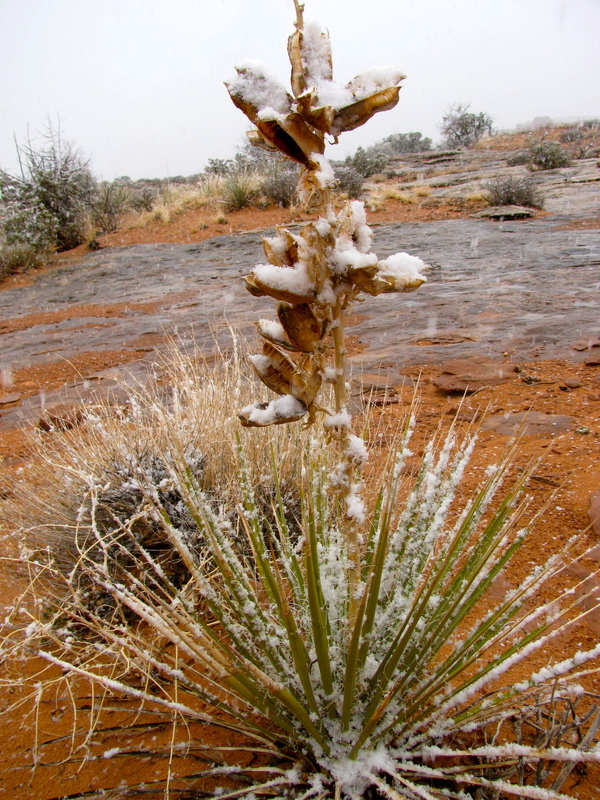 I’ve much to explore in this new light of my third season, but first winter, in Canyonlands National Park.